Bush’s Pasture Park is home to a wide variety of very special places; from gardens and fields of wildflowers to enjoy, to places to relax or explore, to historic structures to visit. 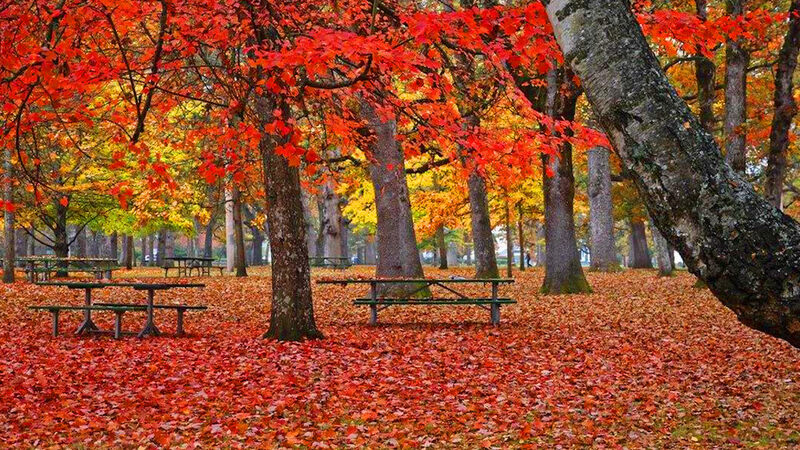 Please come and discover Salem’s gem of an urban park. Bush’s Pasture Park has several playgrounds and picnic areas located near the Bush Barn and both upper and lower Leffelle Street parking lots. There are also numerous trails meandering through the park’s oak groves, wildflower fields, and riparian areas that create delightful opportunities for walking, jogging, conversing with a friend, or just enjoying the great out-of-doors. There are kiosks with maps of the park at all the major entrances, so you should have no trouble finding your way to your favorite destination. A new brochure, Map and Guide to Bush’s Pasture Park, is available in a rack near the kiosk at the Bush Barn parking lot. The Upper and Lower Oak Groves create a cathedral of welcoming shade for picnicking, playing, or just sitting and ‘forest bathing’. 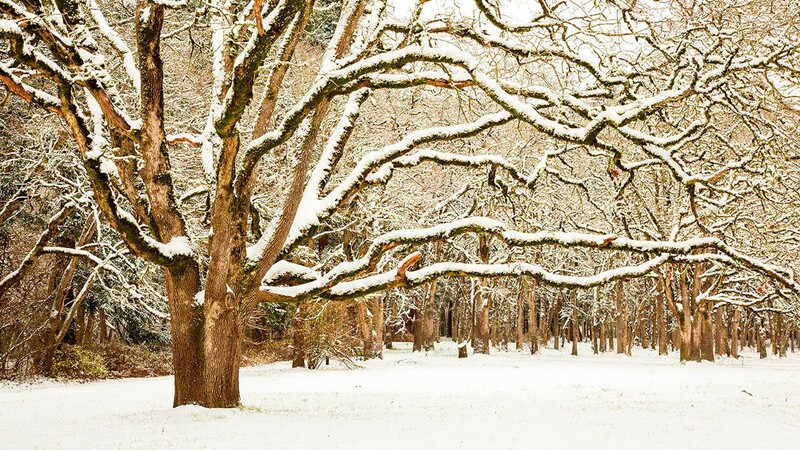 These groves are two of the few remaining natural stands of Oregon White Oaks (Quercus garryana) in the mid-Willamette Valley, remnants of a much larger Oak Savanna. This open landscape was the result of systematic burning by the Kalapuya that began 3,000 to 5,000 years ago. The fire resistant oaks thrived and competing seedling trees, such as Douglas fir, were burned out. This allowed native food sources, such as camas and tarweed, to move into the grasslands beneath the oaks. The upper and lower pastures of the original Bush farmstead remain as open lawn, ideal places for a pick-up ball game, playing Frisbee, or just soaking up the sunshine during the summer. On the rare snowy day, they provide an opportunity to cross country ski or snowshoe. The Bush Conservatory was built in 1882 and fully restored in 2011. It nestles in among a series of mixed borders, named the Conservatory Garden. The area to the north was developed from Miss Sally’s raised beds into a tight series of paths surrounding the linear, espaliered apple trees. The latter and several existing blueberries were planted as examples to be used during the City’s ‘How to Prune…’ classes offered to the public back in the 1960s. We think that many of the larger shrubs in the more northern part of this garden were planted under the direction of Lord & Schryver, but there are no drawings. The garden immediately to the south of the conservatory is planted as a shady mixed border, especially attractive in spring. The interior of the conservatory contains plants popular in Victorian glasshouses, and there are interpretive panels that bring the history of the structure ‘to life’. 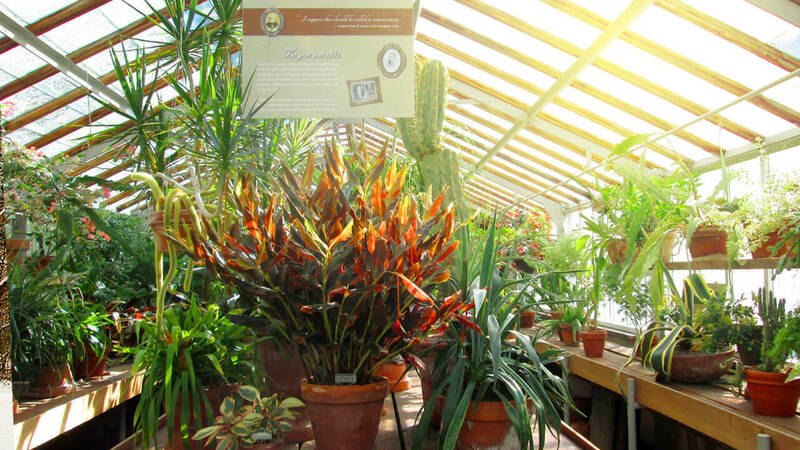 The Bush Conservatory is open 9am – 3pm daily. The Conservancy is considering plans to extend the Conservatory Garden to include the space between the garden mentioned above and the Bush Barn parking lot. Originally this area was used by Salem Parks to ‘grow on’ trees prior to planting them out into city parks, but it has been neglected for the last 20 years, or so. The Conservancy is in the planning stages of developing this into a very informally planted seating area with tables for gathering, working, or enjoying a good book. 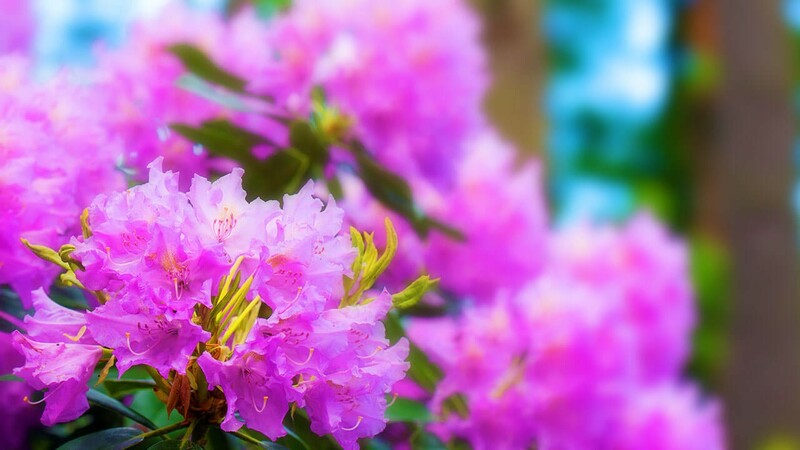 The Rhododendron Hillside features about 130 varieties of species and hybrid rhododendron and azaleas, and well over 300 varieties of companion plants located on a 2 ½ acre east facing slope. These plants, installed starting in 2011, complement a grove of 60-year old rhododendron that lines the top of the Hillside. The beauty is year round, but the height of the booming season is from early March through June. Most of the Hillside’s trails and all the block paths are handicap accessible. The Hillside project began in 2011 with a donation to the City of Salem from the Compton Family Foundation. The area was originally covered by a dense tangle of Himalayan Blackberry. The intent of the donation was to remove the blackberry and develop the hillside into an attractive garden of rhododendron, azaleas and companion plants for the enjoyment of all park users. During 2011, volunteers and staff removed most of the blackberry, installed irrigation, and began to plant. During 2011 through 2016, workers and volunteers improved the trails, installed northern and southern overlooks, and added stairs on the south side. The Rhododendron Hillside is yours to enjoy thanks to both the Compton Family Foundation and the City of Salem, who have contributed wonderfully to these efforts, as have many volunteers. The installation of the rose garden began in 1955 with the planting of the Hybrid Tea/Floribunda Collection on the north side of the entrance road to Bush Barn. The design is an inverted T with the gazebo at its northern most point. This collection has undergone several rehabilitations, the latest occurring in the last two years with the raising of many of the beds with a mixture of clay loam and compost, the planting of 650 new roses, and the addition of new labels installed in each bed. There are 80 beds of Hybrid Tea and Floribunda roses that contain 98 different varieties dating from the late 1950s through 2017. Once the Hybrid Tea/Floribunda Collection was installed by the late 1950s, all of the roses from the Bush Farmstead property were gathered together, divided through the graft, and planted in the four beds radiating out from the north side of the gazebo. To this day these roses are referred to as “Miss Sally’s Roses” for Sally Bush, the daughter of Asahel Bush II, and an avid plantswoman. These roses represent earlier hybrid teas and floribundas dating from the 1920s and 1930s. The third collection that makes up our Municipal Rose Garden is the Tartar Old Rose Collection. 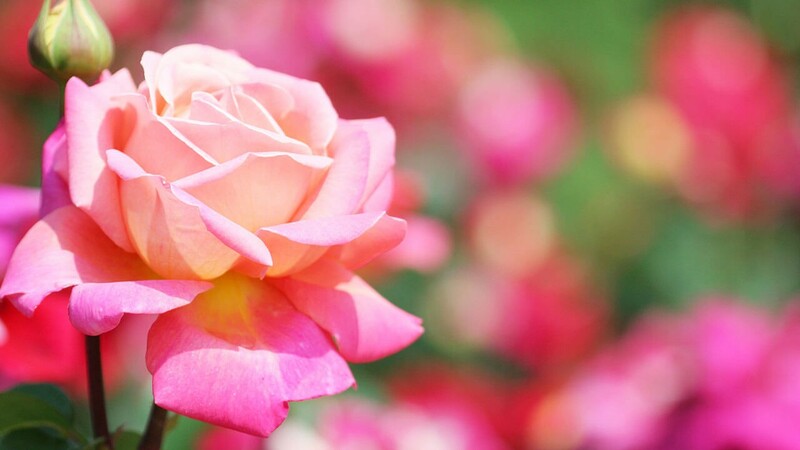 (By definition Old Roses are roses introduced to the public prior to 1857, the date of release of the first Hybrid Tea.) Mae and her husband A.R. Tartar collected cuttings of old roses from historic properties and cemeteries over a 20-year period and planted them on their east Salem property. (These roses represent roses brought across the prairie and around ‘The Horn’ by early pioneers.) As the freeway ‘craze’ of the late 1950s expanded west, the Tartars needed to find a home for their extensive collection. When New York City turned down their offer of the collection for $1,000, the Tartars donated their old roses to the City of Salem in 1960. Elizabeth Lord & Edith Schryver designed the layout of the Tartar Old Rose Collection, including the placement of each rose according to its type. These roses are planted in 17 beds surrounding a circular focal point located in the northwest corner of the rose garden. The Collection containsover 100 species and cultivars of roses. This garden is thought to be the finest collection of old roses on public property in the Pacific Northwest. Mission Street Parks Conservancy, formerly Friends of Bush Gardens, in partnership with Salem Parks maintain the Municipal Rose Garden. “These plantings are absolutely appropriate to the age of the house – a fine setting and unique”, Janet Witter, Portland Old Rose expert and enthusiast. Pringle Creek flows along the western edge of the park, through the shade of big-leaf maples and other native trees, shrubs and ground cover. 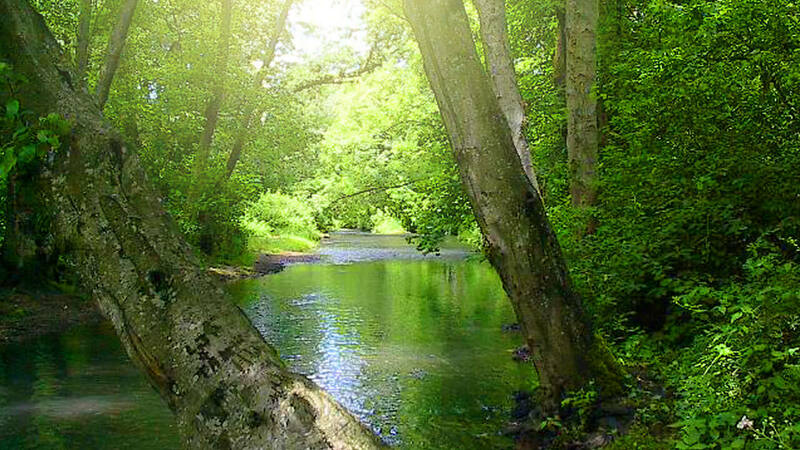 The narrow meandering path that accesses the creek provides a delightful place to ‘go exploring’. The restoration of this streamside habitat, which will focus on the removal of invasive blackberry and other non-native plants, is on the Conservancy’s list of proposed projects for the park. Located in Bush’s Pasture Park, the Bush House Museum is Salem’s 19th century time capsule. 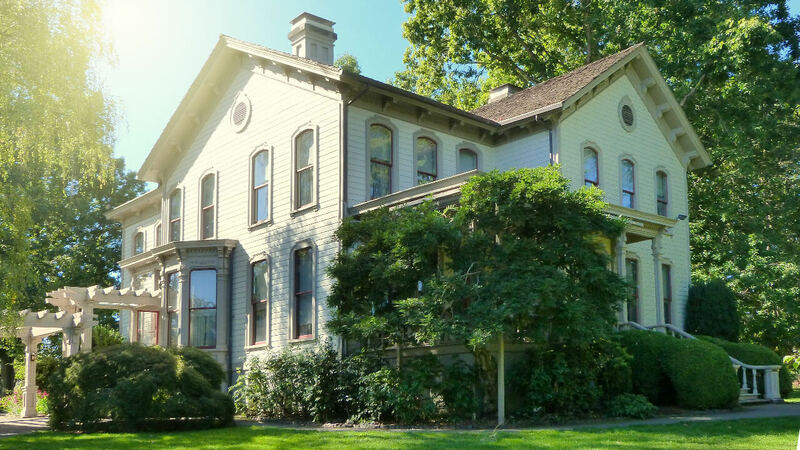 The Museum offers tours to the public and preserves and interprets the heritage of the Bush House and Bush’s Pasture Park to illuminate Oregon history and culture associated with the lives and legacy of Salem’s Bush Family. Featuring many iconic 19th century furnishings, this once technologically advanced home also contains much of its original furnishings and decor. As the comfortable home of a Bush family member until 1953, the Bush House Museum continues to welcome Salem visitors of all ages throughout the year. While in Bush’s Pasture Park, visitors can also explore the recently restored 1882 Conservatory, the second oldest in the west, and the Bush Barn Art Center. In spring the park abounds with wildflowers. 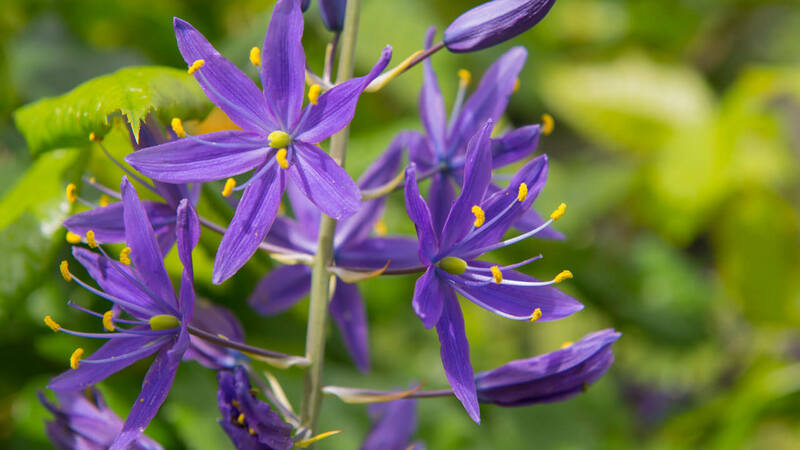 The camas (Camassia quamash) carpet the lower Oak Grove, while the great camas (Camassia leichtlinii) can be found in the Rhododendron Hillside and among a riot of other wildflowers on the Wildflower Slope. 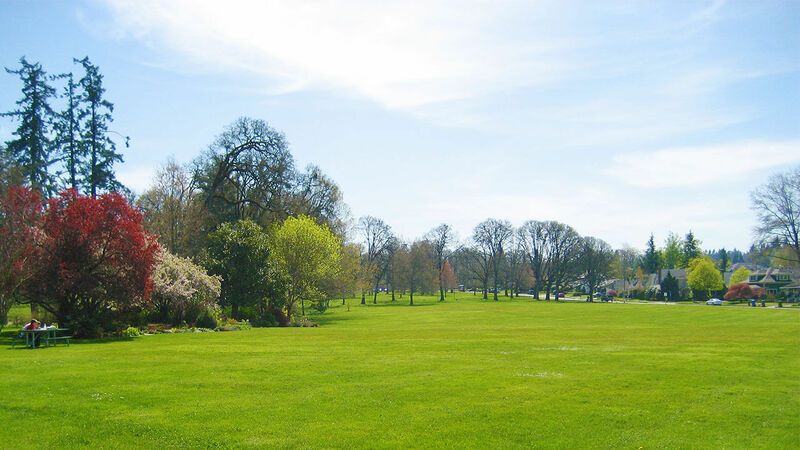 In 1917, in honor of their late father, the Bush family gifted the City of Salem with the lower park area to be set-aside for public use. It was not to be developed as a public park until the Bush family left the Bush farmstead. The area was used for such activities as picnicking, camping, and neighborhood baseball games. The wooded areas were left alone (ie. not mowed). As a result, native wildflowers were allowed to grow and set seed. To this day, these areas are not mowed until the seed has set, usually by late July.